The Secret to Including Employee Donors in Your Year-End Appeals — We are for good. Year-end is no doubt one of the busiest seasons in a development office. Cue the direct mail, the e-mail strategies, the holiday cards and gatherings, and be sure not to forget #givingtuesday, year-end proposals - and how about those last minute reminders to take advantage of a tax-deduction? With all these tactics coming to a head in December - where do your employee donors fit into this equation? Glad you asked. We’ve seen how you can earn your employee donor's trust and build long-term engagement in your employee giving campaign by making (and communicating!) the decision that the employee campaign is the one time of the year you will ask for their support. After all, most of your employee donors are likely to give on a per-pay period basis, so for many they are already continuously giving to you throughout the year. Honor their commitment by drawing a line in the sand - don’t solicit them outside of the annual campaign. Pro Tip: To honor this commitment (and to just keep good form!) always be sure to remove employees from any outbound solicitation efforts at other times of the year outside of your employee giving campaign. We’ve found this to be most easily accomplished by actually using your employee ID numbers as your constituent numbers in your donor database (hello efficiency!) and also tagging employees in the database to allow you to simply withhold that employee tag as you build mailing list queries. Our belief is to extend the reach employee giving year-round, but isn’t the byproduct of asking employees to give year-round. It's the idea of telling their story of generosity year-round. The storyline of employees choosing to band together and give back to fund a patient program, equipment or renovation is evergreen and one that never gets old. Pro Tip: We’ve found sharing the story of employees' investment in philanthropy is one of the most pure, and beautiful ways to point to your mission. Highlight or share a photo of a completed project funded by employees or a capture a video of incredible employee testimony as to why they choose to give back. The power of these testimonies point to a belief in the organization at all levels. It’s a story of compassion. We’ve literally watched donors moved to tears as they’ve learned of their own caregiver’s investment in a program that’s come full circle and touched their life. It's paying it forward in pure form. 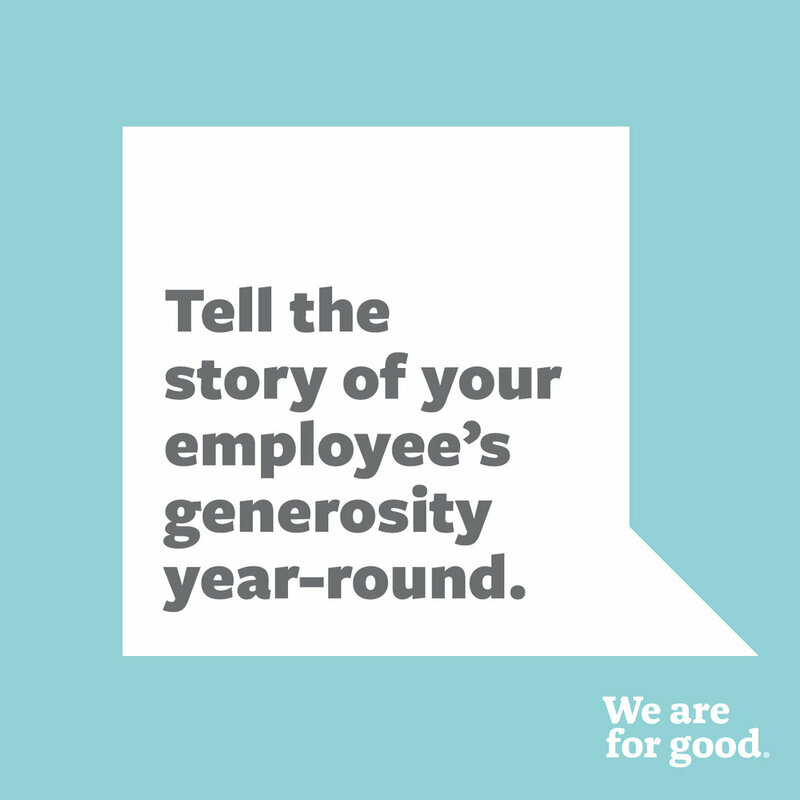 Have you shared a story of employee generosity at year end? What are you waiting for? We’d love to hear your thoughts or experiences in the comments below!